The Grateful Dead played Bob Dylan songs throughout their existence. She Belongs To Me and It's All Over Now Baby Blue were part of the 1966 repertoire. Visions Of Johanna, When I Paint My Masterpiece and Queen Jane Approximately were performed during their last two shows in Chicago in July 1995. In the nearly 30 year period between these dates the Grateful Dead performed 35 Dylan songs, some with Dylan, some without. Additional songs were practised in rehearsals with Dylan or during Grateful Dead soundchecks. The Grateful Dead toured with Bob Dylan for 7 shows in July 1987. Dylan sat in with the Grateful Dead on at least four other occasions. Jerry Garcia sat in with Dylan on at least two occasions. This page summarises these collaborations and lists Dylan songs performed by the various post-Grateful Dead groups involving members of the Dead. A separate page discusses the writing collaboration of Bob Dylan and Robert Hunter. The 7 show Dylan & The Dead tour was documented on the Dylan and the Dead album which was released in 1989. The album comprises 7 songs. Two songs are from the July 4, 1987 show, one each from the July 19 and July 24, 1987 shows and 3 from the July 26, 1987 show. The Dylan & The Dead album version of Slow Train, which is from the July 4, 1987 show, was included on Bob Dylan Live 1961-2000: Thirty Nine Years Of Great Performances, a collection of live recordings. One song, Man Of Peace, from the rehearsals that preceded the July 1987 Dylan & The Dead tour is included on this Dylan themed release. Jerry Garcia, Bob Weir and Brent Mydland contributed backing vocals to the Dylan recording of Silvio on the 1988 Bob Dylan album Down In The Groove. Silvio is one of two songs on the album, the other is Ugliest Girl In The World, that were co-written by Bob Dylan and Robert Hunter. Silvio was released on a single as well as on the Down In The Groove album. A collection of Bob Dylan songs performed by the Grateful Dead. The main CD comprises 11 song, the majority taken from shows in the 1980's. One song is from a 1973 show, one from a Bob Dylan/Grateful Dead rehearsal in 1987. The original release of this album included a bonus CD with two further songs taken from shows in 1985 and 1988. A double CD collection of live recordings of Bob Dylan performed by the Grateful Dead and various Jerry Garcia bands. There are 4 Grateful Dead performances in the collection from shows in 1985, 1989, 1990 and 1995. The other tracks are performed by the Garcia/Saunders band, Legion of Mary and the Jerry Garcia Band and are taken from shows between 1973 and 1993. The earliest Grateful Dead performance of a Bob Dylan song to appear on a Grateful Dead album is on the Birth Of The Dead collection which was released as part of the Golden Road box set in 2001 and then as a separate release in 2003. This performance of It's All Over Now, Baby Blue, is taken from a July 1966 show. Individual Bob Dylan songs appear on many of the Grateful Dead archive releases. 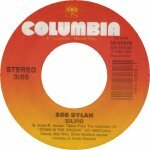 A live performance of Friend Of The Devil taken from a Bob Dylan show is included on Stolen Roses, a collection of Grateful Dead songs recorded by other musicians. Dylan performed the song a number of times in the second half of the 1990's. Dylan also performed Alabama Getaway and West LA Fadeaway live.